The Sarojin, Thailand's luxurious 56-roomed boutique residence, is celebrating the start of this year's wedding season with the launch of a new and enchanting wedding package. Offering the highest level of personalised service, in addition to beautiful beach weddings, couples can now join together at the foot of a mesmerising waterfall in the heart of the jungle, the perfect location for a truly unique and intimate ceremony. Inclusive of luxury accommodation, a wedding ceremony, photography, spa treatments, romantic private candlelit dining on the beach and a special Buddhist blessing of love, The Sarojin's 'Wonderful Waterfall Weddings' are available from THB 128,415 (approximately AUD 4,950) and can be booked year-round. On waking at The Sarojin a truly luxurious service awaits, and this is especially true of the resort's brand new 'Wonderful Waterfall Weddings' package. Inclusive of three nights' accommodation in one of the resort's Garden Residences – upgrading to a Spa Suite subject to availability – The Sarojin's dedicated team will be on hand every step of the way, perfecting even the smallest of details to make for an unforgettable celebration of love. 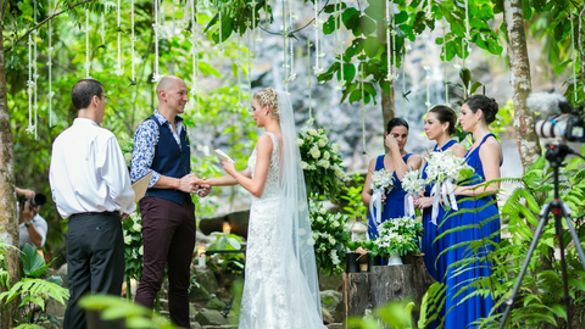 Joining together with Thailand's natural beauty as the backdrop, couples will choose between a Thai or Western wedding ceremony before making their life-long vows to the hypnotic sounds of a captivating waterfall. As part of the package, nuptials include tailor-made vows, readings and music; a Buddhist monk or celebrant; an elegant one-tiered wedding cake; venue hire and set-up; venue decoration including luck chains, frangipani and orchids; a bottle of sparkling wine; a personal wedding planner for bespoke requests; and 4-hours of photography, allowing couples to cherish their special day for a lifetime. Once residing in wedded bliss, couples who book The Sarojin's new package will also be pampered by a highly-qualified therapist, each relaxing into a 90-minute Royal Oriental Massage at multi-award winning Pathways spa, before being joined by their very own personal chef who will spoil them with a delicious Thai dining delight, on their very own private section of the beach romantically set by the gentle glow of 500 glimmering candles. Extending the celebrations further – and for those keen to experience traditional Thai customs – The Sarojin's new wedding package also includes a unique opportunity to receive a spiritual blessing from a Buddhist monk. For an extra special wedding experience, The Sarojin is committed to hosting no more than one wedding per week, creating a more personal experience for the happy couple and ensuring that the venue is unique to each wedding party. Rooms at The Sarojin start from THB 6,400 (approx. AUD 251 ) between 10th May-10 October 2017. All rates are based on two people sharing a Garden Residence and include a sumptuous à la carte breakfast served all day with sparkling wine, and all taxes. Guests can upgrade to a Spa Suite from THB 3,100 (approx. AUD 122) per night, enjoying a one-hour cumulative complimentary spa massage per room, per night. Perfect for wedding celebrations, The Sarojin is also available for exclusive use with prices from THB 430,000 (approx. AUD 16,550) accommodating up to 130 guests, inclusive of all day a la carte breakfast with sparkling wine for all guests and granting exclusive access to the resort and all on-site facilities. Reservations are recommended 12-months in advance to secure preferred dates. The Sarojin is beautifully set on an 11km stretch of secluded white sand beach in Khao Lak, just a 55-minute drive north of Phuket Airport, and is surrounded by five spectacular national parks and the world-famous dive sites of the Similan and Surin Islands. Designed in a contemporary Asian style, the five-star resort's 56 deluxe residences are nestled within ten acres of tropical grounds leading directly onto the beachfront. Each guest room features its own private garden and “sala” sundeck, couples' baths with waterfall showers, and plunge and relaxation pools that blend into the natural habitat. Other facilities include an attentive “Imagineer” who can create tailor-made experiences for hotel guests and complimentary use of a fully equipped fitness centre, mountain bikes, sailing catamarans, sail boats, sea kayaks and windsurfing boards. Tranquility is guaranteed as no children under the age of 10 are permitted to stay at The Sarojin.